Life without the function and appearance of your teeth is tough. Not only do you miss out on many of your favorite treats, but you also endure decreased self-esteem, leaving you reluctant to smile for pictures and engage in conversations. But with dental implants, you’re able to get a fresh start on life. For them to last, though, requires that they be taken care of properly. Otherwise, the result will be dental implant failure in Waco. 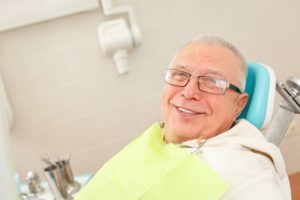 As you read on, your dentist explains the common causes so they can be prevented, and you can enjoy a totally restored smile. Let’s start our journey by gaining an understanding of how the dental implant procedure works. A titanium post is surgically inserted into your underlying jawbone and fuses with it over time through a process called osseointegration. The result is a healthy and strong foundation for your final restoration (crown, bridge or implant-retained dentures) to be added. This sound dental procedure has an over 95% success rate, and in some cases, your beautifully restored smile can last up to a lifetime. Ultimately, though, the success of the procedure is dependent on how well you care for your implants after they are placed. Teeth-Grinding – Also called bruxism, teeth grinding applies unusual tension to your upper and lower teeth and can cause an implant to unseat over time. Infection – One of the reasons that oral hygiene is so important after the dental implant has been done is that it helps to prevent infection by clearing away harmful bacteria. Failure to clean your mouth properly can compromise your implant. Tobacco Use – Another huge hindrance to your oral health and the proper healing after a dental implant procedure, is tobacco use. The chemicals released leave the oral cavity dryer than normal, can encourage infection and eventually contribute to the implant dislodging. Poor Health – It’s also important to have reasonable overall health before having the dental implant procedure done. Your dentist will need to know about any existing issues you have like hypertension, diabetes or other problems, beforehand, to ensure that you have the safest and most effective procedure possible. Insufficient Bone – A final cause of implant failure is insufficient bone mass. This can be the result of waiting too long to have your implants placed, which allows for the degeneration of vital bone material. When you visit your dentist in Waco, you’ll receive a tediously conducted examination to make sure you have enough healthy bone mass, and your current overall health will be assessed to ensure that you’re a good candidate for the procedure. To get the process started to restore your teeth with dental implants in Waco, reach out to schedule a consultation today. Dr. Nick Cobb earned his dental degree from the University of Texas Dental Branch-Houston. He strives to provide patients with the absolute best in care by using the highest level of diagnostic and treatment technology available. Dr. Cobb helps patients smile with confidence and restore lost dental function with dental implants at Heart of Texas Smiles, and he can be reached for more information through his website.